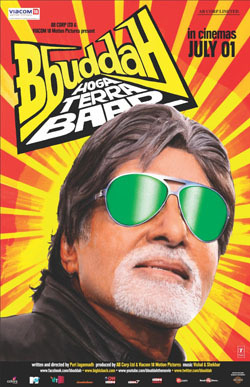 'Bbuddah Hoga Terra Baap' sees Amitabh Bachchan in his 70's self resurrecting his legendary 'angry old man avatar'. In the film, he essays the role of a retired hitman settled in Paris who comes back to India to do ‘one last job’. During the course he comes face to face with his past and that gets him to change his motive for the 'hit'. Written and directed by Puri Jagannadh, the film is his tribute to Bachchan; but the film maker fails to come up with a strong storyline and an arresting screenplay. But the dialogues are soaked in humor and must say, some of them are really innovative. In the acting department, the film is all about Bachchan from start to end and once again he proves that there is no other versatile actor than him. For the young generation who hasn’t seen him in his ‘jubilee hit’ films, the film is a textbook or a reference point on how he has become what he is today and what it takes to be a ‘star’? Prakash Raj as the villain is fantastic and also brings in humour in his character. Hema Malini has a shorter role but plays her part well. Sonu Sood portrays the role of a cop with sincerity and does good action. Sonal Chauhan as his love interest looks nice and has also done a commendable job. Rajeev Mehta as her father is as usual. Charmy Kaur as her friend is a complete natural. Makrand Deshpande adds to the fun element. Raveena Tandon in a cameo is slightly over the top but that’s what her character demanded and she does full justice to it. Music by Vishal – Shekhar is foot tapping but not of ‘hit’ category. Editing by Shekhar (not the same as the music duo) has some loose ends and hampers the flow at times. Cinematography by Amol Rathod is functional. Overall, watch ‘Bbuddah Hoga Terra Baap’ if you want to see Amitabh Bachchan reprise the famous ‘Vijay’ that he had played in popular films like ‘Deewar’, ‘Agneepath’ and ‘Zanjeer’ or you are simply a diehard Bachchan fan. Think of it, who isn’t ? Yet the film disappoints.